Therapeutic Riding Lessons provides instruction in riding and horsemanship with the goal of expanding the cognitive, physical, emotional and social skills and well-being of individuals with special needs. Students of all ages and abilities participate in our program with the goal of learning to ride as independently as possible, gaining enhanced self-confidence from their accomplishments. Lessons at NMCTR are offered in session blocks of eight weeks. Each lesson (group or private lesson is offered) is one hour in duration; students ride at the same time and on the same day each week of the session. 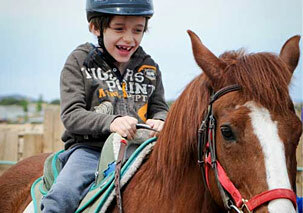 Lessons include learning about horses, horsemanship, and riding skills. Instruction in English and Western riding styles is offered. Throughout the session, each rider is encouraged to increase their skill levels to the best of their capabilities. Lessons are all individual specific and taught by a PATH Intl Certified Instructor. How is success measured? NMCTR conducts a yearly evaluation of each rider and develops a list of goals. Each goal is individual specific and a 7-step process to accomplish the goal is developed. PATH Intl Certified Instructors work together to evaluate the progress and success.